See Tim Burton's off-beat fairy tale tonight at Citi Pond at Bryant Park for the third installment in our Winter Film Festival. New York Times critic Janet Maslin noted the high and low points of the film in her original 1990 review, paying homage to Mr. Burton's vast imagination and far reaching attempts to create a dark, surreal wonderland. At the far end of a suburban enclave, where the houses huddle together like a candy-colored wagon train, there stands a monument to lonely genius. Atop a forbidding gray mountain, in yet another of the strange and ingenious outposts that the heroes of Tim Burton's films ("Batman," "Beetlejuice," "Pee-wee's Big Adventure") call home, Edward Scissorhands lives in isolation. He uses his extraordinary gifts to create magical artworks that, he imagines, no one will ever see. Edward has apparently hidden here for a long time, with nary a trip to the grocery store. 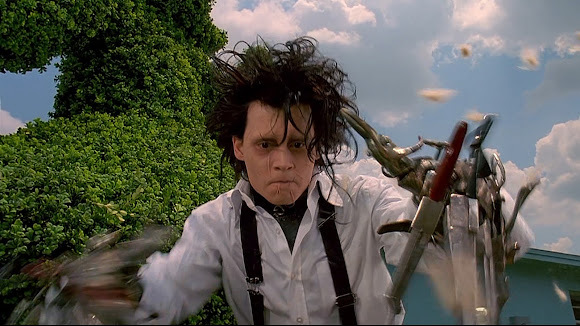 But one day, as seems perfectly reasonable in the ripe, fanciful pop universe in which "Edward Scissorhands" unfolds, a thoughtful Avon lady (Dianne Wiest) pays a visit. Seeing Edward, she immediately grasps that he has a problem and sweetly imagines that it can be solved with kindness, not to mention the makeup base of exactly the right hue. So the Avon lady brings the outcast back to her home, where he amazes the neighbors with his rare feats of snippery. He's a wizard when it comes to poodles. In a sense, Mr. Burton is too. His "Edward Scissorhands" is as crazily single-minded as a majestic feat of dog barbering, with much the same boldness, camp ebullience and fundamentally narrow wit. Like a great chef concocting an exquisite peanut butter-and-jelly sandwich, Mr. Burton invests awe-inspiring ingenuity into the process of reinventing something very small. In the case of "Edward Scissorhands," which opens today at the Ziegfeld, that something is a tale of misunderstood gentleness and stifled creativity, of civilization's power to corrupt innocence, of a heedless beauty and a kindhearted beast. The film, if scratched with something much less sharp than Edward's fingers, reveals proudly adolescent lessons for us all. On, then, to the better side of "Edward Scissorhands": the tremendous cleverness with which Mr. Burton brings these ideas to life. As embodied by Johnny Depp, Edward himself is a stunning creation, with a blackish cupid's-bow mouth and plaintive expression to offset his fright hairdo, abundant scars and potentially lethal hands. Those hands, which quiver uncontrollably when Edward experiences strong emotion, are the one aspect of the young man that his creator (played by Vincent Price, who was a hero of Mr. Burton's when the director was still a young Disney animator) neglected to complete. The inventor died just before he could equip Edward with human hands, thus leaving him with these scissor-bladed prototypes. They make a great sight gag, if not a great metaphor. As in each of Mr. Burton's films, the production design is the central good idea, perhaps even the sole one. This time, with production design by Bo Welch ("Beetlejuice") and cinematography by Stefan Czapsky, it involves bright colors in unlikely combinations, for instance, a lavender-suited Avon lady driving a dandelion-yellow car) and fashionably ridiculous late-1950's artifacts placed prominently throughout the characters' bunkerlike homes. On the lawns of these houses, more and more of Edward's singular topiaries -- in the forms of a ballerina, a penguin, a set of bowling pins and so on -- begin to appear. It is very much in keeping with the film's fearless, defiant illogic that these shrubbery sculptures should appear where no shrubs grew before. Similarly, the film makes no bones about depicting Winona Ryder as a white-haired granny in the not noticeably futuristic prologue, and as a high school girl, circa 1960, when most of the action takes place. Ms. Ryder, in the former capacity, promises to explain to a grandchild what the story of Edward Scissorhands has to do with snowfall. It's also in keeping with the film's reasoning that the explanation for this, when finally revealed, isn't nearly as interesting as promised. Ms. Ryder plays Kim Boggs, the daughter of the Avon lady, Peg, and a dryly deadpan patriarch (played by Alan Arkin). As lovely as she is diffident, she makes an enchanting Beauty to Mr. Depp's poignant, bashful Beast. When Edward first arrives in suburbia, he is so flustered that he scares Kim away. (He also inadvertently punches holes in her waterbed.) But he soon becomes part of the household and part of the community, despite insensitive questions -- like "Do you know about bowling?" -- from the locals. Soon Edward is so much at home that he is virtually a household convenience, helping Peg snip threads when she sews. He also becomes extremely popular with the women of the neighborhood, some of them fascinated by his knack for inventing odd haircuts, and one (played with funny flamboyance by Kathy Baker) especially interested in discovering his other talents. The women in the film, with the exceptions of Peg and Kim, are ninnies, but the men are no more flatteringly presented. Kim's boyfriend (Anthony Michael Hall) is a lout, a bully and the cause of Edward's eventual undoing. Among the film's more haunting visual touches, all of which linger much longer than the possible reasons for their inclusion, are the peculiar shrinelike assemblage of clippings in Edward's fireplace; the bladelike beams that open a hole in his roof to the heavens and the inventor's cherished machinery, so pleasantly antiquated that the machines seem to have animal faces. The traces of warmth that spring up unexpectedly, even in the sequence that finds Edward and Kim amid snow and ice, are what save "Edward Scissorhands" from its own potential archness and give it the sweetness of a bona-fide fairy tale.